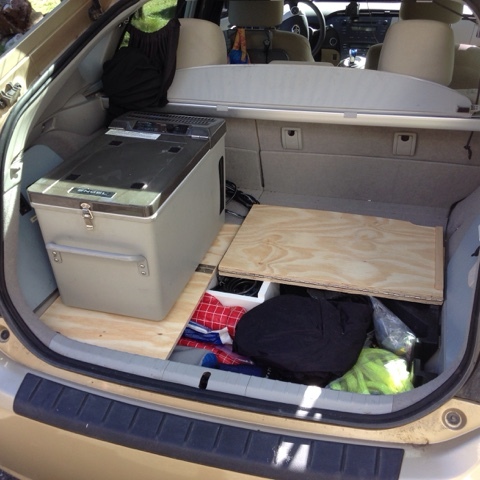 Above is my redesigned Prius Split Rear Hatch floor compartment door. This solution allows my compressor fridge to sit on the 40% split-side while still being able to access storage under the cover on the 60% side where my bed is. Before this change, I was required to move the fridge every time I wished to access the storage space when on my travels. 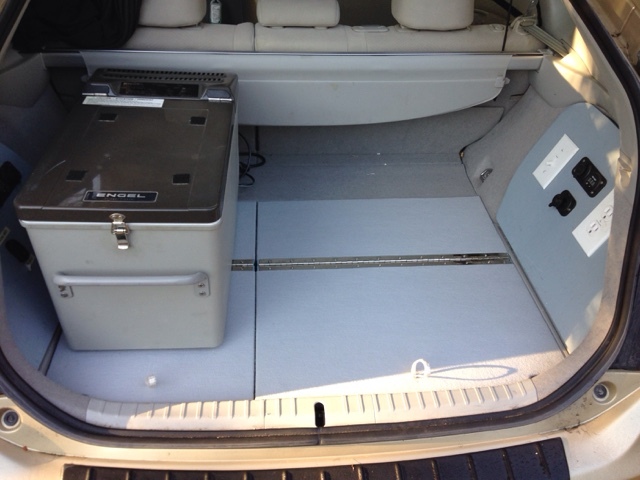 Since space in my Prius Campervan is limited, I usually access this space daily, making moving the fridge aggravating. I know, I traveled doing this for the 2015 and 2016 Travels. You can see the marks on the original Prius cover, where the compressor fridge sits on the 40% side of the back. Marks are exacerbated by the daily movement. 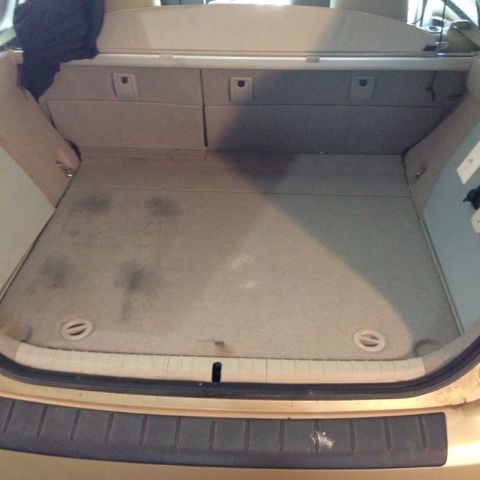 Above is the original Prius cover with the single storage door open. The original Prius cover is plastic and makes for a great template to make my split cover design. Note that sides of the original Prius cover are not square, so I had to cut the outside edges of my design to match the taper of the original cover. The 60/40 center cut was a straight cut. 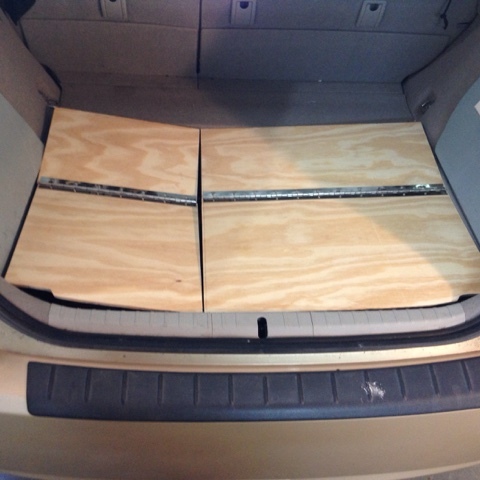 I used 1/2" plywood, which is the same material i used for the bed platform to replace the rear seat. 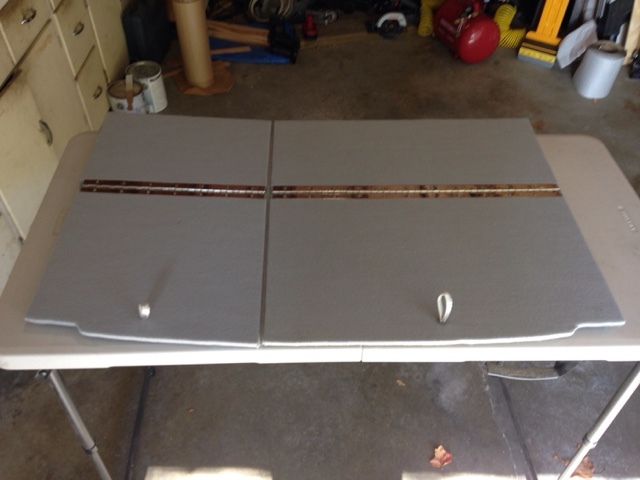 See separate post on my rear seat bed design that I did the first year I traveled in the Prius. If you look at the underside of the Prius Cover you will see it has indents where it sits on the rim of the tray below the cover. What this means is that I needed to add shims to the bottom edge of the plywood to fill the voids to have it sit flat around the edges. Problem! You can see (above) the sag where the two sides sit next to each otehr. Since the Prius cover is made with full side to side support there is no sag in the center. This split design is not supported full length side to side so there is a sag in the middle that I needed to address. I use 1/2" plastic board in some of my designs so I made a box that covers all four corners of the new split cover design. This plastic box stores some cables for me and sits on the plastic Prius pan directly below this cover. In testing out my design (above), you can see the white box I made to support the split cover design. 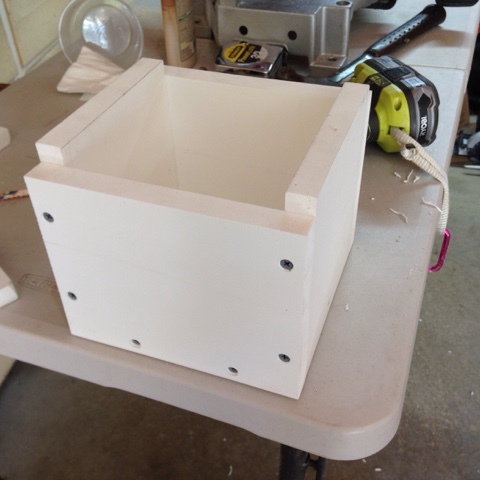 The box is usable space and provides the support all in one. After validating my design I chose to spray paint the plywood with gray paint to protect the wood and match the Prius interior. In addition to the pain on both top and bottom I added felt to the top on either side of the piano hinge and rolled over the sides. 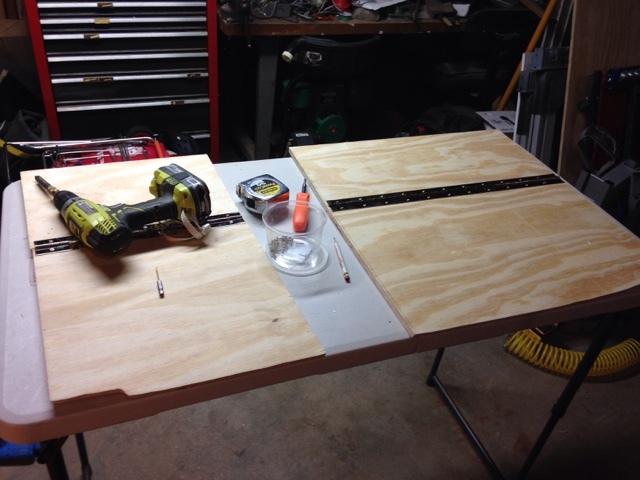 Then I drilled holes and put pull straps up from underneath to make for easy lifting of the new access panels. I protected the area where the hinge was with masking tape and sprayed contact cement on the service and laid the felt on top. With this change I am ready for my 2017 Prius Travels without having to move the fridge each day. The whole enchilada looks SO neat & tidy, now, I have a burning question: Where do you place your bed, or better yet where will you sleep ? My feet / legs fit along side the fridge with my head behind the front passenger seat. I have a thermarest backpacking mattress and a sleeping bag. This post shows my bed platform in the back seat area. 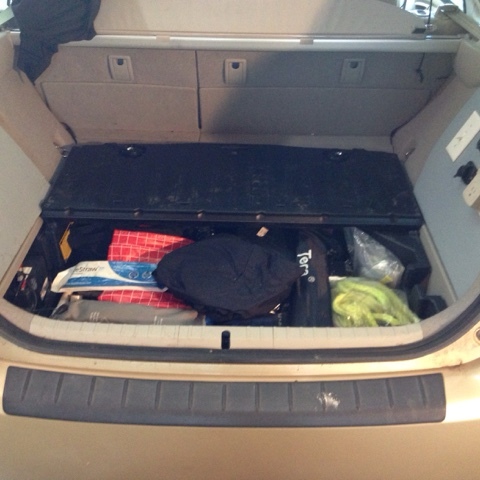 I remove te rear seats and designed a platform that is over my clothing storage and that is over my 6 gallon fresh water storage. Thanks for the question. My modifications use the Prius features. This way it looks cleaner. I have other mods to make my life on the road.